Enjoy five star comfort and service in one of Bogota's most exciting new nightlife zones! Who said you can't enjoy five-star luxury at an affordable price! 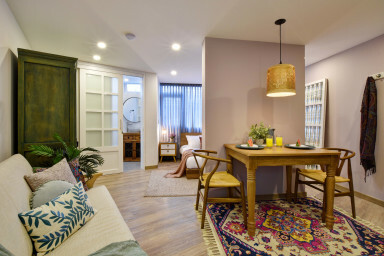 At Konrad Apartments we have we have combined the best of old world charm, modern luxuries, comfort and convenience to bring you an unrivaled experience for amazing value in one of the most exciting areas in Bogota. Our units feature custom designed interiors with beautiful decorations and unique, thoughtful adornments throughout. We mix exclusive design with modern and functional appliances for today's traveler. Our fully stocked kitchens include ovens, microwaves, toasters, coffee makers, and hotel quality plates, glasses and cutlery. The bedrooms also include top quality linens, large screen smart TV's and USB power outlets to directly charge your phone or other devices. Of course, you can also count on free high speed wi-fi in any of our apartments. If you're looking to enjoy Bogota to the maximum, you'll want to stay in one of the best locations, and in an apartment that offers you everything you'll want for an enjoyable and convenient stay. We are available 24/7 for any inquiries or questions you might have.